Country Nepal is situated in a location / continent South Asia. Nepal has an area of 147 181 km2 and 29 890 686 residents. The highest point has a height 8 850 above sea level. and it is called Mount Everest. The lowest point is located at the level of 70 above sea level and it is named Kanchan Kalan. System of government is Federal Republic.The capital city is Kathmandu. Nepal has the international abbreviation NP. Total gross domestic product (GDP) is 38 280 000 000 $. Total gross domestic product per capita in purchasing power parity is 1 300 $. GDP grows by 3.50 % a year. Inflation (consumer price index) is equal to 9.10 % a year. Nepal have 18 000 000 working-age population (from a total population 29 890 686 people). Unemployment is at 46.00 %. Nepal issued 5.80 % GDP to healt care and 1,60 % GDP to army. The total amount of foreign debt is 3 777 000 000 USD. As suggested above, Nepal has 29 890 686 people. Population growth is in the amount 1.77 % per year. Number of children born per 1000 population per year is 21.85.Every mother has average 2.41 children. The infant mortality rate is 43.13 and maternal mortality 170.00 deaths per 100,000 births. Average estimated life expectancy makes 66.51 years. Mortality is 6.75 people per 1000 population per year. Nepal has 17 282 km of roads, 59 km of railway lines and 47 airports. Number of active mobile phones (sim card) in the country Nepal is 13 355 000. Number of active fixed telephone lines is 845 500. Nepal has 577 800 internet users, who have the available 41 532 Internet connections. Nepal has been assigned a domain first Choose range .np. Nepal consumes a year 4 833 000 000 kWh of electricity. Annual electricity production is 3 156 000 000 kWh in power plants with a total installed electrical capacity 717 000 kW. Nepal exports 0 kWh and imports 70 000 000 kWh of electricity per year Energy mix of power generation is as follows: fossil fuels: 7.9 %, nuclear energy: 0 %, renewable: 0.0 %, hydropower: 92.1 %. 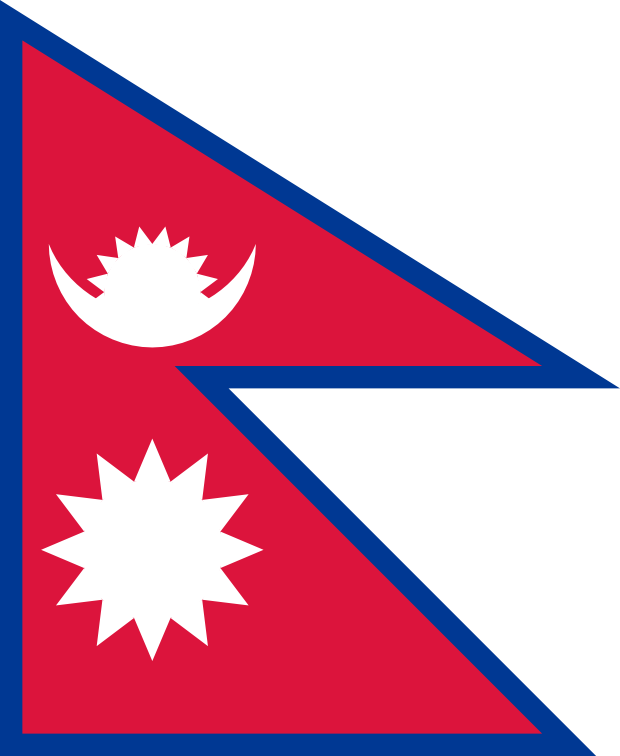 Keywords: list of countries, Flag of Nepal, flags of countries in the world, telecommunications, economy, flag, Flags of countries, information, list of flags, transport, flag states, Nepal, all flags, world countries, national flags, demography, energetics, politic.